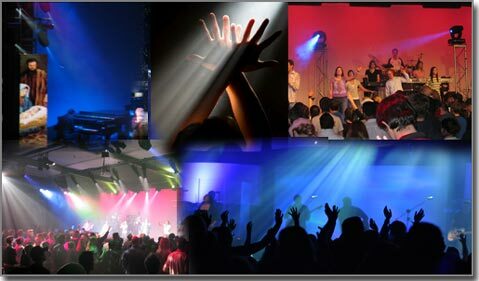 Lighting in houses of worship is as varied as the worship itself. The demands of this environment requries the lighitng console to be a practical archetectual controller one day, a concert desk the next and a theatre board another day. Because LightFactory is at home in all these situations it is the perfect fit for any size venue. The familiar PC interface makes it easy for novice users to understand while its advanced feature set will satisfy even the most demanding event. "We use LightFactory at Belhaven University for several different styles of events. These include weekly chapel services, band concerts, dance concerts, theatrical plays, musicals, pageants, classes, and campus meetings. The ability to have multiple cue lists in one spot makes this easy, as we simply open up a different cue list for each type of event, and can switch back and forth without needing to close the software, or open a different file. We use conventional luminaires, LEDs, and a few movers. All of these are easily controlled and programmed with LightFactory. When I think back to our "older days" of using a conventional lighting console I wince at how difficult and archaic it was. We upgraded to LightFactory with two universes for less than half of what our original conventional lighting console cost. Whether you're looking into lighting control for the first time or looking to upgrade an existing system, I'd recommend giving LightFactory major consideration before going with anything else. It is versatile, easy to set up, and fun to program. As a bonus, Martin and the crew at LF provides great support."